Computers, on the other hand, have gotten smaller and smaller over the years-remember Main Frame computers? You don’t, that’s something you only read about. Laptops were a welcome development-a small computer you can carry around-who would have thought that would be? So, as I was scouring the internet, I chanced upon a peculiar flash video. 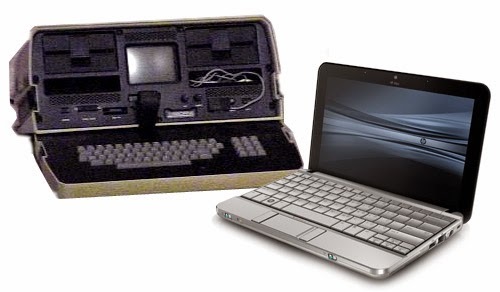 The first laptop! Weighing only 13 kilograms, the thing looks like a combined microwave and typewriter! Introducing 1983’s Portable LCD Computer! Whoa! Now, start imagining how this jumbo shrank to your palmsize-tablet! BusinessWeek has this post on the evolution of laptops that will make you drool. Your beloved laptop was once a knitting machine! How about that for making you feel better, at least you evolved from a monkey.